Logo Design that tells your story, grows your audience and helps you sell products. The focus of discovery is where I ask questions to understand your business, goals and vision. We discuss the project to get a greater insight into the core value of the project and begin working together. Outcome: A clear and defined understanding of the project. Before commencing any work I take a 50% deposit and then proceed to direct the project by researching, creative thinking, sketching and exploring ideas for the best solution from the information we dicussed. Outcome: Custom design to best suit your audience. The final part of the process involves executing on the best direction and using design tools to create awesome work. You will receive 3 directions and we will refine the design based on the project goals and your feedback. Once the final design is approved and balance is recieved, the files will be packaged nicely in high resolution. Outcome: Great design to share with your audience. If you’re new here, check out my youtube channel where I share knowledge logo design and their impact on starting a business. FREE email course straight into your inbox! Awesome! you'll receive an email shortly. 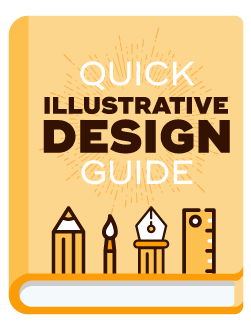 Get the FREE illustrative design guide when you sign up. You’ll also receive updates on helpful design.